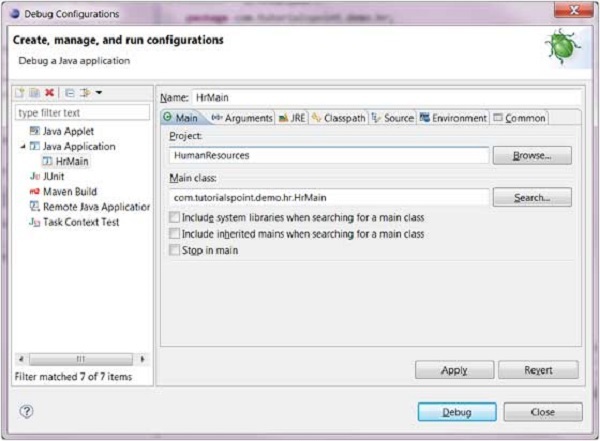 An eclipse debug configuration is similar to a run configuration but it used to start an application in the debug mode. Because the application is started in the debug mode the users are prompted to switch to the debug perspective. The debug perspective offers a number of views that are suitable for debugging applications. 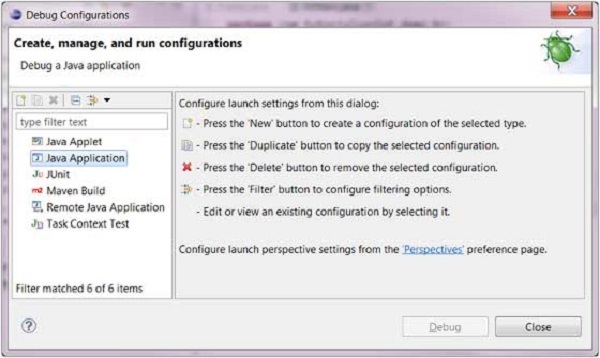 The Debug Configuration dialog can be invoked by selecting the Debug Configurations menu item from the Run menu. A name for the debug configuration. The name of a Project. The name of a main class. Zero or more program arguments. Zero or more Virtual Machine arguments. To save the run configuration, click on the Apply button and to launch the application in the debug mode click on the Debug button.